A robotics tournament for elementary and middle school students will be held at Grossmont College on Saturday, Nov. 3. Sixteen teams, each with eight participants in fourth through ninth grade, will compete in the tournament organized by East County Robotics Alliance, a local nonprofit group. The public is invited to watch the robot matches from 12:30 to 3 p.m. at the college’s Health and Sciences Complex, Building #34. Admission is free. Cory Hoover, founder of East County Robotics Alliance, said the tournament will consist of three competitive aspects, including robot design, research and adherence to core values. The core values include teamwork, working to find solutions, learning together, the spirit of friendly competition, discovery is more important than winning, sharing experiences, gracious professionalism and fun. Hoover said the entrants will be asked to develop innovative solutions designed to improve the lives of senior citizens, including assistance with daily tasks, transportation or any other challenges seniors face. This is part of an occasional series about successful alumni from Grossmont and Cuyamaca colleges. La Mesa Police Chief Ed Aceves thanks one of his Administration of Justice instructors at Grossmont College for launching his law enforcement career. Aceves entered Grossmont College after high school, but left to attend the police academy when was hired as a police officer for La Mesa. Three years later, he was back and finished his AS degree in 1991. 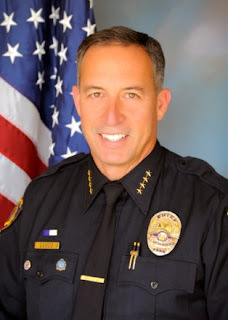 Aceves received his bachelor’s degree from California State University, Long Beach in 2005 and in June, completed a master’s degree in criminal justice and security from the University of Phoenix. Aceves worked his entire career in La Mesa, first as a patrol officer, later in the DARE drug awareness program, as a SWAT team leader and as a trainer for the department in defensive tactics. He has taught at the police academy and worked security at the Olympics in Atlanta in 1996, and attended the FBI National Academy in Quantico for a three-month leadership program. By Cindy L. Miles, Ph. D.
I’d like to tell you about Justin Dile, whose inspiring story echoes that of many of the thousands of active duty and returning veterans attending Grossmont and Cuyamaca Colleges. Justin served eight years in the Army Reserves, including a 15-month active-duty deployment in Iraq, where he suffered a traumatic brain injury from a roadside bomb explosion. Justin came to Grossmont College to get his life back on track after returning stateside with post-traumatic stress syndrome. He credits the college’s caring professors and veterans support services for helping him shift from combat to the classroom. Justin was a high school dropout before entering the military, but he learned to excel at Grossmont. Last fall he graduated with honors and transferred to the University of San Diego. But Justin didn’t leave Grossmont behind – he “pays it forward” each week as a part-time assistant in our Veterans Affairs Office. Since 2008, community colleges across the country have seen a sharp influx of veterans like Justin. This trend is expected to continue as the U.S. military offensive winds down in the Middle East and more troops come home. Grossmont College’s veteran enrollment has doubled in the last four years and is now about 2,000. Cuyamaca College’s student veteran population now nears 800. Since 2009, both colleges have been giving veterans and active duty personnel first-in-line privileges when registering for classes. In commemoration of National Disability Awareness Month, Cuyamaca College will host its 15th annual Wheelchair Basketball Game from noon to 1 p.m. Wednesday, Oct. 31, this year preceded by a resource fair with nearly a dozen services and agencies for people with disabilities. Both the game and fair, scheduled for 11:30 a.m. outside the gym, are free and open to the public. Anyone interested in playing is invited to join in. The five-on-five games typically feature a mix of Cuyamaca’s basketball team playing alongside wheelchair basketball team players from throughout the county. With all players shooting and dribbling from the low-to-the-ground, highly maneuverable wheelchairs, tumbles and spills are always as much a part of the rousing action as the pivoting and spinning of custom-built chairs across the gym floor. For Cuyamaca College’s students learning the ropes of the music industry, this week’s visit by the man who recorded some of rock’s most iconic works is one lecture not to be missed. Grammy-nominated producer/engineer Ken Scott, whose remarkable career working with the likes of The Beatles, David Bowie, Elton John, Pink Floyd, the Rolling Stones and others is chronicled in a new book, “Abbey Road to Ziggy Stardust,” is putting on a presentation 1 p.m. Friday, Oct. 26, at the Cuyamaca College Performing Arts Theater. The lecture and demonstration is an opportunity for students and the public to hear the multi-track recordings of classic rock tunes broken down in a way few people have ever heard outside of the studio – one instrument at a time. The British record producer/engineer, widely known for being one of the five main engineers for The Beatles, will follow up his presentation with a question-and-answer session. Now living in Los Angeles, Scott has been on the road, promoting the book he co-authored with fellow music-industry veteran Bobby Owsinski. Cindy L. Miles credits her mother for never letting her think that a woman’s dreams or aspirations should be limited by her gender. “She was a feminist before there was a word for it,” said Miles, chancellor of the Grossmont-Cuyamaca Community College District. Miles’ efforts on behalf of the college district since she became chancellor 3 ½ years ago were recognized Friday by the San Diego East County Chamber of Commerce, which presented her with a Women in Leadership award for education. The award was presented at a chamber luncheon attended by more than 400 people at the Town & Country Hotel in Mission Valley. As stellar providers of workforce training, Cuyamaca and Grossmont colleges have been recruited to join a global network of leading colleges and universities helping companies and businesses bettter train and develop their workforce. The two East County colleges are among the first in California to partner with the nonprofit training-management organization, Global Corporate College, to provide corporate and business clients customized employee training and development. The Global Corporate College network is expanding to include community colleges in every state, with partnerships also in progress in Europe and Asia. This is part of an occasional series on successful former Cuyamaca and Grossmont students. Sara Bendrick, the star of a 13-episode show on the DIY network, began her career as a landscape architect by taking classes in ornamental horticulture at Cuyamaca. She calls Brad Monroe one of her mentors. Bendrick took courses at Grossmont to get enough units to transfer to California Polytechnic State University, San Luis Obispo. But it was the Cuyamaca classes that cemented her interest in plants and led to a bachelor’s degree in landscape architecture. She has worked as a professional landscape designer for large commercial projects and private residents, and launched her own business, Sarita Landscape Design, earlier this year. In January, she participated in a nationwide talent search for a pilot project on the DIY network, which will be called, “I Hate My Yard.” She is set to begin filming the first segments in January 2013. A promo for the show states that the host "whips unruly outdoor spaces into shape -- no matter how bad -- with economical, yet clever, landscape designs." If Cuyamaca College grant writers were members of a college sports team, they would be basking in the glory of a triple-season winning streak. You’ve heard of the Dream Team? Meet Cuyamaca’s Green Team. Since June 2009, the crew has had had every one of its 39 grant proposals funded for a total of $7.3 million to train hundreds of students for solid-paying, dependable jobs, including those in up-and-coming green industries. The grants have also funded pilot programs, which have since been expanded and modeled by other colleges. The latest win for the five-member team is a pair of grants totaling more than $730,000 from the California Community College Chancellor’s Office. The two Industry-Driven Regional Collaborative grants were two of nine approved for funding out of a total of 41 proposals statewide for workforce training in everything from design robotics to nanotechnology. On the flight deck of the USS Midway Museum, a floating tribute to America’s past wars, the region’s community college leaders said dwindling budgets are affecting their ability to serve military members and veterans returning from today’s conflicts and heading back to school. More than 20,000 veterans, active military and their dependents attend the nine community colleges in San Diego and Imperial counties, and their enrollment numbers are climbing because of the Middle East drawdown of forces. With four years of state budget cuts, college leaders said the results of the November election will determine whether they will be forced to make even sharper cutbacks in classes that will delay the progress of veterans and other students trying to complete their education.